Leading advertising and digital marketing agency Austin & Williams has created a new website for longtime client Crest Hollow Country Club in Woodbury, NY. The announcement was made by A&W principal/brand strategist, Eva LaMere. As agency of record for the past seven years, Austin & Williams already knew that the Crest Hollow’s greatest strength—its ability to accommodate a wide range of social and corporate events—could present a challenge for the site visitor. Crest Hollow Country Club Director of Sales Janine Dion is particularly pleased the new website includes so much outdoor video and photography. “We’ve heard many times that people don’t realize what expansive grounds we have in back of the venue,” Dion said. “Austin & Williams knew that the best way to capture the pool area and cabanas during daylight, sunset and evening was with time-lapse video shot from a drone. It was the perfect solution.” In addition to Web design and development, the agency is Crest Hollow’s source for print creative, collateral, video production and search engine optimization (SEO). 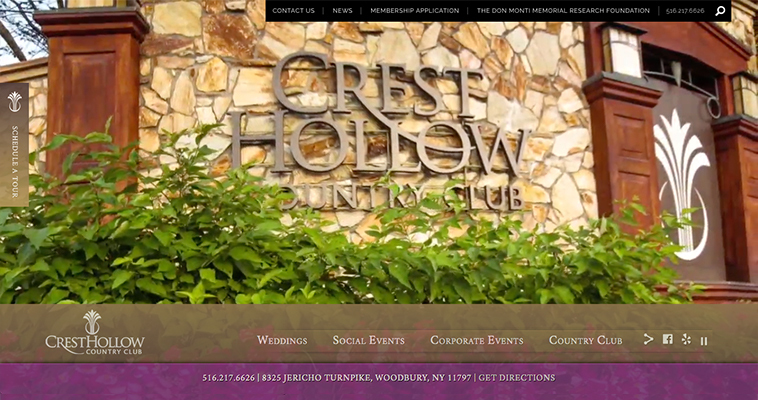 The new Crest Hollow Country Club website can be viewed at www.CrestHollow.com.